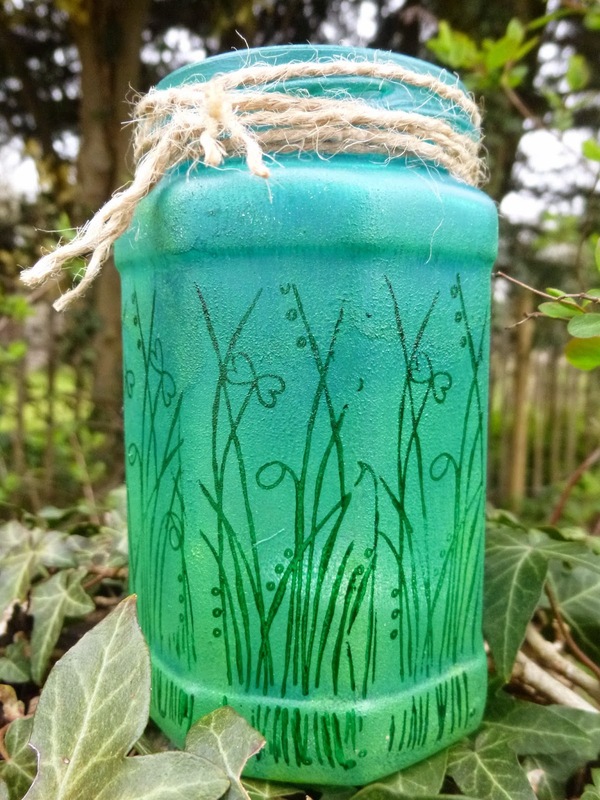 Hello everyone, Alison from Words and Pictures here - and delighted to be back at PaperArtsy to share a simple make to light up your garden on a summer evening. I started with a really nice octagonal jar (from some fancy jam, I think, or maybe mustard!) and a "what if?". What if I mixed my Fresco paint with a Glaze? Would that help it adhere to the glass without a sealing coat first? Answer: yes! You can see the array of colours which got applied - Inky Pool, South Pacific, Hey Pesto, Limelight and Zesty Zing. They're all translucents and each of them got mixed with a good dollop of Pearl Glaze (at least 50:50 I'd say) and then gradually blended with one another as we progressed from the bottom up. ... and then patted over the top with some Cut'n'Dry Foam, while the paint was still wet, creating the softer textured look. I grabbed some of Darcy's grasses (fun to say that!) from the Eclectica³ Darcy 07 set, and stamped them around the jar in Forest Green Staz-On. To catch the rim at the bottom, I turned the stamp upside-down and stamped the ends of the stems around there. And then, of course, lots of twine around the top for a rustic garden look. I love that it looks opaque, but is actually beautifully translucent. Look at it from the inside - you can see that stamping through the glass so clearly. And it looks so beautiful with a tea-light lit inside. Get those octagonal reflections! I wish I could capture the subtle glow of the whole jar but, as you'll know if you've ever taken photos of candles alight, the image gives you the candle far brighter and the rest duller than the naked eye receives it. Hope you like the results of my "what if?"... I think there are going to be quite a few of these dotted around my tiny courtyard this summer. I'll have to do most of them with normal round jars, which will make the stamping a little trickier. But it should be fine. I managed it with my Christmas Lantern, after all. The textured paint helps to "grab" the stamp, and if you stamp in small portions rather than trying to get it all done in one, it should all work out. Thanks so much for stopping by, and have fun playing! A huge thanks to Alison from all at PaperArtsy HQ. Wow this is so lovely, that dreamy glow of the inside is wonderful. I really like the texture created by stippling with foam over the brushed layer. A garden full of these twinkly jars would be magical...so it's a PaperArtsy party at your's then? Very cool Alison. Might knock up a few of these to have on the table outside this summer!! You're so good at "what if" Alison... Love the colours and with the light shining through it's fantastic. Fabulous! Great experiment with wonderful results. 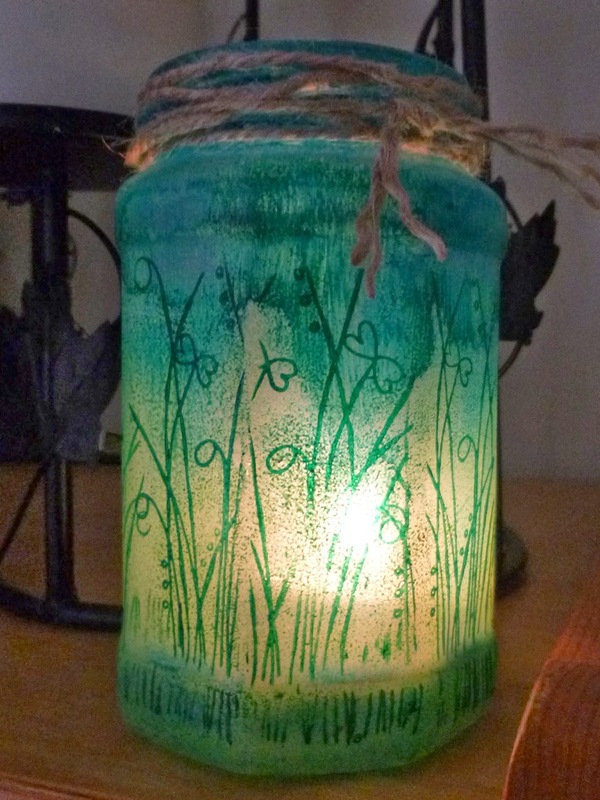 I'd love to see your garden lit with these lovely painted glass lanterns! Alison, that is so lovely! And such a great idea. I've got a pile of glass jars waiting to be taken to the bottle banks, might have to take out a few & have a play. This is really pretty! I think I'll have to start saving nice jars now! Beautiful Alison and a great effect. There is an advert on the TV at the moment for Douwe Egbert's coffee and someone on there has done a similar thing with a coffee jar, you could look out for that jar, it's really nice (if you like that coffee!!). Brilliant idea! I love this Alison. Just been to check out the fridge, & found an interesting chutney jar that Hubby has agreed to finish off for the sake of art! Lol! Lovely Alison, need to go finish of some jars now! Wow, that's gorgeous, Alison! And good to know the paint/glaze stays put. Wonderful idea Alison, love your lantern!! This turned out wonderful, I can't wait to try one! Oooohhh I love this idea Alison and I'll be rustling up some jars to alter tomorrow. :) I can see these on my front porch with a citronella candle in it for the summer. 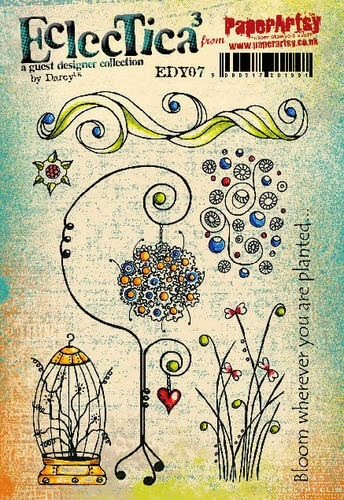 Love the colors and the stamps you used on your lantern. Absolutely gorgeous!!! What a fabulous idea! Guess that I will need to get F&T to eat all our jam up so I can have a go!!! Thank you for sharing how you experienced the mixing Glace with paint. Good to know. What a fabulous idea! Love the design. Now if only we got enough summer to enjoy them too! Your mind must never rest. I love your "What If" project. 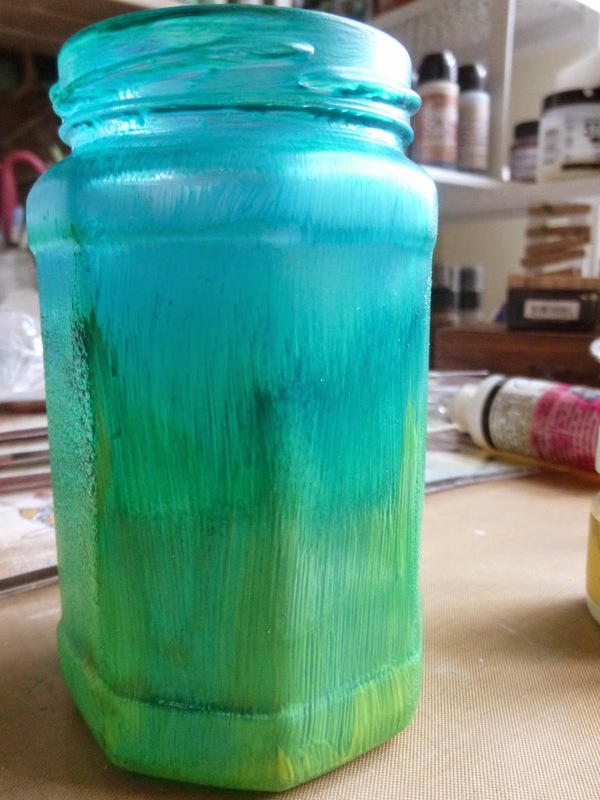 Beautiful blended colors to make a gorgeous lantern. Thanks for sharing your talent! thank you for this great idea to make trash to treasure! This is stunning Alison. 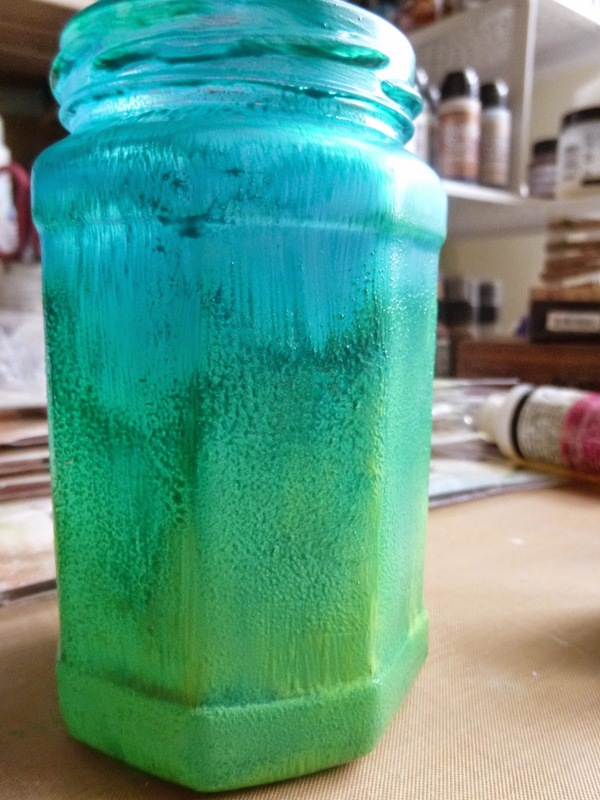 I've decorated jars with stamping before but not with the paints and this look is just gorgeous. I didn't have time to even look at the blog this past week so too late for the challenge but I'm definitely going to have a go at this technique. Thanks for the details. Brilliant idea. I use citronella candles to keep the mosquito's away from the gazebo lights. I think I may try making a few of these. They would also look great with some wire wrapped round and round the neck and hung in the trees of a patio. I love it, I love it! Fabulous idea, both functional and gorgeous! Thank you for sharing all the steps. So pretty! I love that it looks solid but then it really is translucent. The colors and the grasses you used are perfect for this card light! I love the results. What a gorgeous decor piece! Beautiful! Wouldn't this make the most gorgeous gifts for friends. Love it!